Made of 100% recycled materials in the USA. The Custom Embroidered Gunwale Boarding Mat is a plush yet durable cover that protects from marks and scratches while creating a safe way to board your boat. Made from our UV resistant, marine grade carpet material and backed with a non-skid, non-marking rubber that won't deteriorate over time. 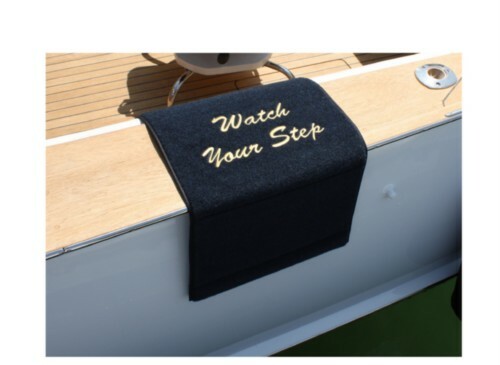 Our Gunwale Boarding Mat can be customized with your embroidered boat name or logo, adding that personal touch. Our cover is sand weighted at both ends to prevent the mat from sliding during boarding or blowing overboard. All logos will be centered below the last line of text. All text messages will be embroidered in a centered format unless specified otherwise. When ordering please use the remarks field to notify us that you would like to customize your layout differently. Please allow typically 4-6 business days to make plus shipping from California. Only Goudy, Avante and Designer fonts can be used as ALL CAPS. 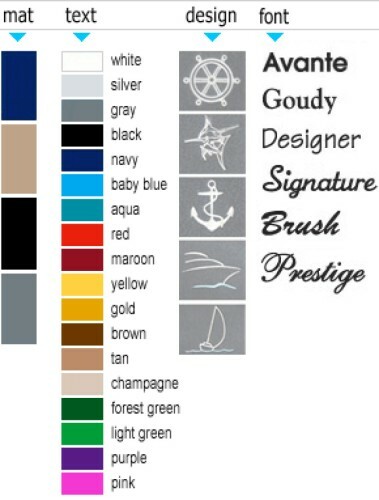 The materials & thread colors displayed above are to represent the colors available. There may be variances in appearances due to computers, screen resolution, and actual tone, etc. These products are not returnable. I just recieved this boarding mat & was VERY pleased with the quick shipping even with personalization. The mat is a great quality & sturdier than the average mat. The monogramming was large and looks great. Will be ordering from Sandie's in the future. on 1/24/2011 Great Product, Even Better Service! I bought this boarding mat as a gift and could not have been happier, both with the quality of the product and the excellent customer service. The mat itself is one of the nicest I've seen, the embroidery is beautiful, and when I called for customer service, I was 110% satisfied with my phone experience. Shortly after I placed my order, I received a call from the owner of the company asking if I needed the mat by a certain date. As it was a Christmas gift, I did, and the company shipped the mat to me 2nd day air at their own expense so I would receive it in time. I have recommended Sandie's Galley to many of my boating friends and will continue to do so.